The interactive animation illustrates the principle of electromagnetic induction using the example of a rotating conductor loop. The 3D model in the rectangle in the upper left corner can be rotated. The animation shows a conductor loop that rotates within the magnetic field of a horseshoe magnet. The magnetic field induces an electric current inside the conductor loop. The 3D view shows an electron flow represented as blue spheres, moving through the conductive material. 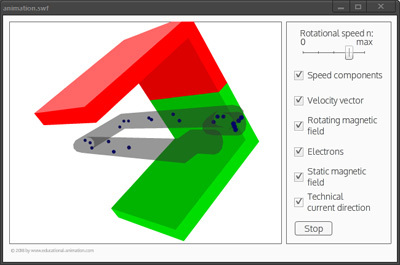 In the 2D view, the magnetic field and the technical current directions can be displayed. This also illustrates the relationship between physical and technical current direction. The rotation speed can be freely adjusted via a virtual controller. The movement of the electrons adapts itself easily to all adjustable speeds.